There are lies, there are damned lies, and then there are corporate credit bulls. Should a corporate credit bull assure you that the sun will rise in the east tomorrow morning, get verification from a Société Générale analyst before you consider acting on the information. One of the credit bulls' most infamous (and, unfortunately, popular) lies is that "Corporate America is flush with cash." This is dangerously misleading. It is true that a small number of companies, primarily tech giants, do have large, healthy cash hoards, but the average U.S. corporation is not only not rich, but is in fact indebted to a horrifying degree – more so than before the financial crisis. 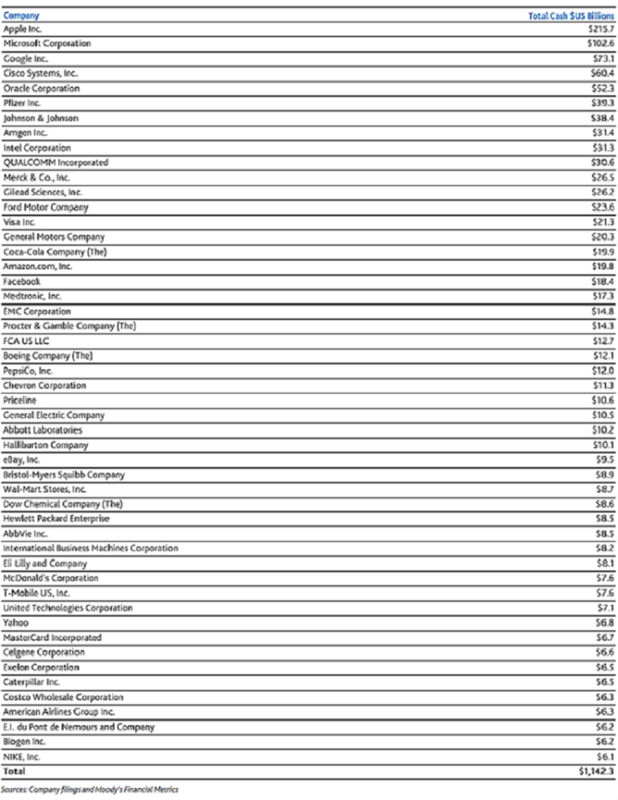 In fact, right now, just 50 companies – the top 1% of all U.S. corporations ­- control half the cash on the S&P 500. The other 99% of companies are in terrible shape, leveraged to the gunwales. They are toxic and liable to default. Recently, Moody's Investors Service and Standard & Poor's published comprehensive reports analyzing U.S. corporate credit quality. The reports make sobering reading. While the two credit agencies' numbers aren't precisely the same, they are close enough and paint a troubling picture of a heavily indebted corporate sector. Relying on the excellent analytical work of Société Générale SA's (OTCMKTS ADR: SCGLY) Andrew Lapthorne, I warned about this situation starting in mid-2014. You see, it wasn't just the world's central banks that decided to solve a debt problem with more debt. U.S. corporations have been partying like it's 1999 when it comes to borrowing cheap money courtesy of the feckless Fed, and the result is an overleveraged and unproductive corporate sector whose riches are narrowly shared by a small percentage of companies, while the vast majority of Corporate America is being slowly suffocated by too much debt that it can never repay. According to Moody's, U.S. non-financial corporations rated by the firm held $1.68 trillion of cash at the end of 2015, up 1.8% from $1.65 trillion a year earlier. 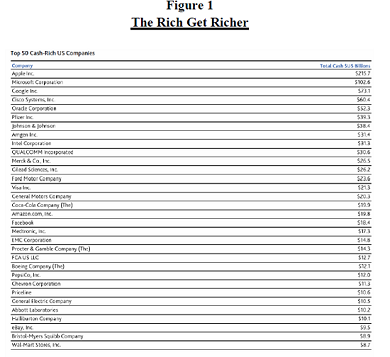 The top 50 holders of cash accounted for $1.14 trillion of this cash (see Figure 1). The top five companies – Apple Inc. (Nasdaq: AAPL), Microsoft Corp. (Nasdaq: MSFT), Alphabet Inc. (Nasdaq: GOOGL), Cisco Systems Inc. (Nasdaq: CSCO), and Oracle Corp. (NYSE: ORCL) – held $504 billion in cash, or 30% of the total, up from $440 billion a year earlier and $404 billion two years earlier. But the other side of the balance sheet told a different story. Total corporate debt was $5.03 trillion at the end of 2015 compared to $2.62 trillion at the end of 2007. Net debt (i.e. debt net of cash) was $3.39 trillion at the end of 2015 compared with $1.88 trillion at the end of 2007. Now, when we look deeper at the ability of corporations to service their debt, the ratio of debt to earnings before interest, taxes, depreciation, and amortization (EBITDA), which measures cash flow, was 2.88x at the end of 2015 compared with 2.46x at the end of 2014 and 2.85x at the end of 2008. What's more, speculative-grade debt-to-EBITDA was 6.15x at the end of 2015 compared to 4.86x at the end of 2007. In layman's terms, corporations are much more highly leveraged today than on the cusp of the financial crisis. Corporations have been able to get away with it because interest rates are much lower today than a decade ago. Unsurprisingly, most of the cash is held by the highest-rated companies. Investment-grade companies hold 87% of all corporate cash ($1.4 trillion, up from $624 billion in 2007), while speculative-grade companies hold only 13% ($368 billion). This reveals a few illuminating things…. First, tracking broader conditions in our economy and society, the rich are getting richer. This is a result of monetary policy that cheapened the price of money and made it more easily available to those who need it the least and less readily available to those who need it the most. Second, investment-grade companies are generally in good shape (other than those in the commodities industry) and probably offer a reasonably safe place to earn some modest nominal yields in a zero-yield universe. Third, the small percentage of overall cash held by speculative-grade (i.e. high-yield or junk) companies is likely to prove insufficient in a serious recession or financial crisis. As noted above, this data is consistent with the work of Société Générale's Andrew Lapthorne, who has warned for over two years that U.S. non-financial companies have at least 40% more net and total debt than in 2007. Goldman Sachs has also confirmed these figures. High debt levels are disguised by low interest rates, but remain high nonetheless. At some point, all of this debt has to be repaid or it will default, and defaults are indeed starting to increase significantly (primarily, though not exclusively, in the oil patch). Standard & Poor's claims that total corporate debt increased by $2.8 trillion over the last five years, while corporate cash rose by only $600 billion. Even more alarmingly, after backing out the top 1% of corporations, the remaining 99% saw their cash holdings fall by 6% in 2015 and held just $900 billion in cash versus $6.6 trillion of debt at the end of 2015, a cash-to-debt ratio of 15% that is even below the trough of 16% in 2008 (and down sharply from 23% in 2010). These numbers are never mentioned by the folks touting high-yield bonds as a great investment in the financial media, but they are important. The high-yield market is going to see a lot more defaults as the "zombie companies," Corporate America's walking dead, who are operating now but entirely unable to refinance their debt, end up going bust in the next two to three years. Don't be caught holding these companies or their bonds when they do finally fall. This snapshot of an increasingly indebted corporate sector dovetails with other troubling trends that suggest that economic growth will continue to struggle unless the incentive structures for corporate behavior are drastically altered (which requires tax reform and fiscal policy initiatives). At the Mauldin Strategist Investment Conference in Dallas in May, David Rosenberg reiterated a point he has made for a while, that capital spending is running far below what is necessary to sustain economic growth. This is consistent with research done by Lacy Hunt and Van Hoisington showing that only a small percentage of corporate borrowing is spent on productive activities such as capex and research and development (R&D). For example in 2015, corporations spend less than $100 billion of the nearly $800 billion of money they borrowed on capex and R&D. Instead, they devoted the majority of their expenditures – and the money borrowed to fund them – to stock buybacks, dividend increases, and mergers and acquisitions (M&A), leaving them with less productive, more leveraged, and more goodwill-laden balance sheets. In other words, they borrowed more money without improving their ability to service or repay it. Financial engineering dominates corporate activity, resulting in an over-indebted and unproductive economy that is more susceptible to shocks. Standard & Poor's raised its 2017 default rate forecast to 5.3%. Moody's is even less optimistic and raised its default rate forecast to 6% by the end of 2016. Nonetheless, the average yield on the Barclays High-Yield Bond Index dropped from just over 10% in February to 7.3% on May 30. The average yield on the energy sector of the index dropped from over 17% in February to 9.82% on May 30 as well, but this is deceptive because the 70+ companies that defaulted since oil prices collapsed dropped out of the index. Speaking generally (which is all you can do in evaluating broad-based investments in high-yield bonds through ETFs and mutual funds and similar vehicles), a 7.3% yield on a high-yield bond or 9.8% yield on an energy bond in this environment is woefully inadequate to compensate investors for the risks involved in owning them. The writing on the wall couldn't be much clearer. The jump in the default rate is in its early innings and whatever gains were enjoyed since February are likely finished as more companies default over the next two to three years. I continue to believe that Marty Fridson's default forecast of $1.6 trillion of aggregate global corporate bond defaults between 2016-19 is reasonable based on a normal default cycle; if we have a recession or a financial crisis, the number will be much worse. There are many "zombie companies" across a broad swathe of industries (not just commodities but retail, for example) that are only hanging on because of low interest rates and the willingness of their private equity sponsors to milk them for fees rather than restructure their debts now in order to give the businesses the debt relief and capital necessary to grow (or survive). As a result, the damage in the corporate sector is likely to be worse than in 2008. If you own high-yield bonds, and especially if you own high-yield ETFs and mutual funds, get out while you can. The people promoting these toxic products do not have your best interests in mind. As Standard & Poor's points out, "In an economy where the top 1% of companies controls over half of the cash, analyzing the U.S. corporate credit market can no longer be done on a holistic basis, or even on an investment-grade versus speculative-grade basis." In other words, investors need to do their homework and be very selective in the bonds they buy. The ETF view of the markets doesn't come close to telling the real story of what's going on; it's also a great way to lose money. However, I do think that the fallen angel space (fallen angels are bonds that lose their investment-grade ratings) looks attractive. On a risk-adjusted basis, fallen angel bonds tend to produce very attractive returns. They rarely default (except in cases of fraud or extreme changes in conditions like the current commodity collapse) and tend to be large companies with significant resources to ride out storms. Investors looking for yield should seriously consider the fallen angel space, and the simplest, best play there is the Market Vectors Fallen Angel ETF Trust (NYSE Arca: ANGL). I LIKE GOLD WHAT DO YOU HAVE?